Boarding Point: River embankment in the city centre. Directions and a map link will be included in your booking confirmation. Boarding Time: 10 minutes before departure. Fancy a glass of bubbly as you glide along the river? The Prague Prosecco Cruise is a fun way to see the sights and take in the beautiful ambience of the city. The river cruise is aboard a luxurious, ultra-modern boat with a retractable glass roof and sides, affording participants panoramic views of the riverside attractions. With the Old Town on one side of the river and the Lesser Town on the other, we sail under Charles Bridge and take in Prague Castle, the Rudolfinum, Prague Parliament and the National Theatre from the unique perspective of the water. As much of the vessel is made of glass, there are spectacular views to enjoy all year round from inside the boat, while on fine weather days the glass roof is retracted. Included in the price is a glass of Prosecco and refreshments. For further drinks, the bar on board serves Prosecco by the glass and the bottle, Champagne, and a range of beers, wines, spirits, and hot and cold soft drinks. The cruise also includes an interactive audio guide, to play on your smartphone via the boat's Wi-Fi, plus a printed map showing the sights along the river. 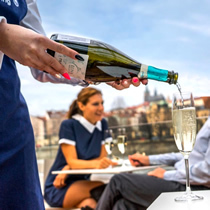 The Prague Prosecco Cruise is a fine way to finish off an afternoon of sightseeing, or it could be an early start to a glorious evening! Groups of any size can book this cruise, and we will ensure you are seated together. River cruise + Glass of Prosecco (or juice) + Small refreshments (selection of cheese) + Interactive audio guide + Printed map showing the sights along the river.